Is It Time to Move Your Security to the Cloud? Despite spending an estimated $85B on security in 2016, the volume of malicious attacks has grown dramatically, billions of records have been stolen, and data breaches are at an all-time high. The traditional choice for internet security used to be appliances deployed at the network perimeter, but the world has changed, and this model is not working as well as it used to. View this on-demand webinar to learn about the challenges that a cloud first, mobile first world poses for legacy security appliances, and the benefits that a cloud-based approach to security can deliver. In this webinar, Senior Solutions Engineer Tom McNash will review how new threat attack vectors are working, how cyber criminals are building threats in new ways today—whether for malware, phishing or denial-of-service attacks--and what security approach businesses need to be adapting to defend against these attacks. He will also explain how the profile of attackers targeting businesses is changing, and how one traditional form of defence against sophisticated attacks—the appliance sandbox—has itself become the object of attacks. Have you noticed an uptick in phishing traffic reaching your company’s users? Phishing has become an industry, with new methods appearing and new “dark web” services increasing the evasiveness and sheer volume of both mass and targeted phishing threats. In this webinar, Cyren’s senior threat analysts will explain the latest phishing techniques and dissect examples of Office 365-targeted phishing campaigns, review how the phishing “industry” works today, and align these developments with data from real-world security performance assessments, in order to inform Office 365 administrators and IT managers as they choose among approaches to security. In this webinar, Cyren’s senior threat analysts will explain the latest phishing techniques and dissect examples of Office 365-targeted phishing campaigns, review how the phishing “industry” works today, and align these developments with data from a recent survey of Office 365 deployments, in order to inform Office 365 administrators and IT managers as they choose among approaches to security. • What phishing campaigns are targeting Office 365 today, what do they look like, and how do they work? • What are the latest techniques being used in phishing campaigns to avoid detection? • What phishing services are now being provided on the dark web, and what Office 365 credential “phishing kits” are being sold? • Are more mass-mailed phishing and targeted phishing campaigns reaching Office 365 users, and if so, by how much has each increased during the past 12 months? Why is email security back on everybody’s agenda? Why do email security solutions seem to be improving only slightly in certain areas, and getting worse in others? Or is that not true? In the midst of the current phishing and ransomware epidemic, security must get better – but how? View this on-demand webinar to hear Michael Osterman of Osterman Research share the responses he received when he recently put these questions to IT managers and security practitioners, and benefit from the insights of an accompanying research paper laying out the reasons for the growing rate of “Business Email Compromise” and what must be done. Office 365 is a capable and robust platform with a wide collection of features and functions. Like any large platform with diverse capabilities and a diverse user base, customers must analyze if it provides the depth of capability or specialized functionality they require in areas like security, archiving, authentication, eDiscovery, encryption, and file sharing. To help IT and security managers identify such feature or performance gaps, Osterman Research has just published a 22-page report entitled “Why Your Company Needs Third-Party Solutions for Office 365.” In this webinar, Michael Osterman will review the results contained in the report of detailed research into Office 365’s functionality across several areas. A complimentary copy of the report will be provided to all webinar attendees. • What particular issues must be understood by companies with hybrid environments, i.e., those with Office 365 as well as on-premises Exchange, some other on-premises system, or even a second hosted email service. Die Flut an Cyberattacken ist im vergangenen Jahr deutlich angestiegen und werden in 2019 immer intelligenter und raffinierter. Attacken wie Emotet und TrickBot machten im Januar und Februar ein großer Anteil der Phishing-Angriffe aus. Die Eindringlinge haben es nicht nur auf die IT-Spezialisten in Unternehmen, sondern auch auf Ihre Mitarbeiter abgesehen. Unternehmen begegnen dieser Herausforderung häufig mit einer Vielzahl von Sicherheitslösungen nach dem Best-of-Breed-Ansatz. Ein aufwendiges Management, mangelnde Integration und nicht erkannte Sicherheitslücken sind die Folge. The Microsoft Office 365 platform currently blocks over 5 billion phishing messages a year. But as mass and targeted phishing attacks increase in volume, speed and evasiveness, is additional protection needed to secure Office 365 email for your organization? To answer this question, Osterman Research’s principal analyst will share insights from a recent study of Office 365 deployments, and Cyren’s global director of solution engineering will walk through the phishing kill chain and point to practical opportunities to enhance defences. •What is the current experience of Office 365 deployments in terms of phishing security? •What are typical limitations for Office 365 deployments in dealing with today’s phishing threat landscape? •Considering how phishing attacks work, what countermeasures are available at each stage? •What are 10 steps organizations using Office 365 can take to stop phishing attacks? Have you noticed an uptick in phishing traffic reaching your company’s users? Been impressed by the sophistication of so many phishing sites? Phishing has become an industry, with new services and sophisticated turn-key “phishing kits” allowing nearly anyone to develop sophisticated attacks. In this webinar, senior threat researcher Magni Sigurdsson will share the latest findings on phishing kits, including which brands are the most targeted, and go in-depth on the five most-used phishing kits, showing actual examples, reviewing the mechanics of how they work—including the evasive tactics utilized to evade detection—and explaining how both users and security systems can recognize them. • What are the top phishing kits today in terms of “market share” that users are likely to encounter? • What brands are being targeted by the phishing kit industry? • What techniques are being applied to phishing web sites and phishing campaigns in general) to evade detection? • How can users identify the most sophisticated phishing web sites? How can security systems do so? • What are the key phishing trends to look out for in 2019? Ist Ihnen ein Anstieg an Phishing-Verkehr, der Ihre Mitarbeitern erreicht, aufgefallen? Phishing ist eine Industrie geworden, mit neuen Methoden und neuen „Dark Web“-Diensten, die immer schwerer zu erkennen sind und schon durch das bloße Volumen von Massen- und gezielten Phishings auffallen. In diesem Webinar wird Marcel Leitel, die neuen Phishing-Technologien erläutern wie auch Beispiele von auf Office-365 zielende Phishing-Kampagnen aufzeigen. Erfahren Sie, wie die heutige Phishing-Industrie funktioniert und gleichen Sie diese Entwicklungen mit den Ergebnissen einer neuen Untersuchung zu Office-365 ab, die Office-365-Administratoren und IT-Manager bei der Auswahl der verschiedenen Sicherheitskonzepte unterstützt. - Welche Phishing Kampagnen zielen heute auf Office 365? Wie sehen diese aus und wie funktionieren sie? - Welche neuesten Techniken werden von Phishing-Kampagnen eingesetzt, um Erkennung zu verhindern? - Welche Phishing-Dienste werden im Dark Web angeboten und welche Office 365 ‚phishing kits‘ werden verkauft? - Erreichen mehr Massen-Phishings und gezielte Phishing-Kampagnen Office 365 Nutzer und wenn ja, um wie viel ist dies in den letzten 12 Monaten angestiegen? Ransomware such as CryptoLocker, CryptoWall and Locky are targeting businesses with massive hybrid cyber-attacks that leverage both email and the web to fool your employees and penetrate your cyber-defenses. These attacks encrypt all the files on your employees’ computers and demand ransom payments via Bitcoin to decrypt the data. So far, law enforcement has been helpless against these attacks, and IT teams are struggling to protect their organizations from these sophisticated threats. View this on-demand webinar broadcast to learn how ransomware attacks happen and what you can do to protect your business from them. Ransomware such as Petya and WannaCry are targeting businesses with massive hybrid cyber-attacks that leverage both email and the web to fool your employees and penetrate your cyber-defences. These attacks encrypt all the files on your employees’ computers and demand ransom payments via Bitcoin to decrypt the data. Download this webinar to learn how ransomware attacks happen and what you can do to protect your business from them. Cyren has developed a free Email Security Gap Analysis test in order to measure how well a company’s in-place security is performing relative to detection by Cyren’s global security cloud, and recently published a report with aggregated data on results from assessments done in September and October. The webinar will cover a discussion of the findings in that report, additional insights and threat examples uncovered during assessments (appropriately anonymized), and how to have your own gap analysis done. - How much spam, malware and phishing are current email security systems missing? - What was the range of results for different assessment participants, considering different case studies? - What factors drive higher or lower “miss” rates for malicious emails, even for systems provided by the same security vendor? - What might be an expectation for my own company’s security? - How is an email gap analysis conducted? - What is involved in terms of configuration and are there any impacts to current email operations? - How can I arrange to run an Email Security Gap Analysis for my own company? - What are the eligibility requirements? To maintain security, how critical is it really to inspect web traffic that is encrypted via SSL? Here we review global SSL traffic trends and share insights from analysis of traffic through Cyren’s global security cloud. Browser-based mining for cryptocurrency is up 725% globally since the debut of Coinhive. The rapid spread of "cryptojacking" is grabbing headlines and driving discussion about this new "business model" for websites, but the problems and risks posed by cryptomining run deeper than just non-consensual use of a small bit of CPU power. The introduction of the EU GDPR has forced mid-market and smaller enterprises to re-think their data governance processes. Many now recognise the benefits of following similar best practices to those adopted by larger enterprises. Others have seen a significant increase in subject access requests and are struggling to locate information in a timely manner to meet the new response deadline. The result is that organisations of all sizes are showing renewed interest in email archiving. However, the options available can be confusing – from the native archiving built into your email service, like Office 365 or G-Suite, to an enterprise scale archive for all data and content types. This webinar presentation by Arna Magnusardottir, Senior Malware Researcher at Cyren, will provide an end-to-end look at fileless ransomware attacks and show how they fit into the current ransomware landscape. Using real-world examples, she will cover the range of techniques in use, common attack vectors, and strategies for defense for IT and security managers. 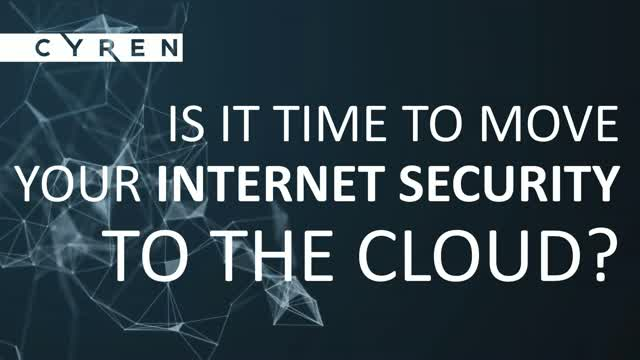 More than 1.3 billion users around the world rely on Cyren’s 100% cloud internet security solutions to protect them against cyber attacks and data loss every day. Powered by the world’s largest security cloud, Cyren delivers fast time to protection from cyber threats with award-winning Security as a Service for email, sandboxing, and DNS for enterprises, and embedded threat intelligence solutions for security vendors and service providers. Customers like Google, Microsoft and Check Point are just a few of the businesses that depend on Cyren every day to power their security. Title: Is It Time to Move Your Security to the Cloud?